Every year, tens of thousands of migrants from poor and war-stricken countries attempt a risky journey by boat for what they hope will be a better life in Europe, according to EU border patrol agency, Frontex, who counts the number of migrants apprehended by border patrols along Europe’s shores. Nearly 300 migrants drowned last year just half a mile off the southern Italian island of Lampedusa, and in the last week the Italian navy has rescued thousands from the rough seas off the Sicilian coast. With the number of migrants waiting to travel to Europe by sea suggested by one immigration official to be in the hundreds of thousands Italian leaders are debating the $12 million monthly cost of those rescue efforts. Overstaying a legal visa is another way to become an unauthorized migrant in Europe. Some migrants who arrive by sea, land and air may initially live in Europe with legal status but stay longer than their visas allow, becoming unauthorized residents. However, the exact number of migrants in this category is difficult to ascertain. Many migrants travel very long and perilous journeys through several countries before embarking on their final journey by boat. The exact number of people who die making the voyage from Africa to Europe is hard to know, but unofficial reports by advocacy groups estimate as many as 10,000 migrants have died crossing the Mediterranean during the last two decades or so. 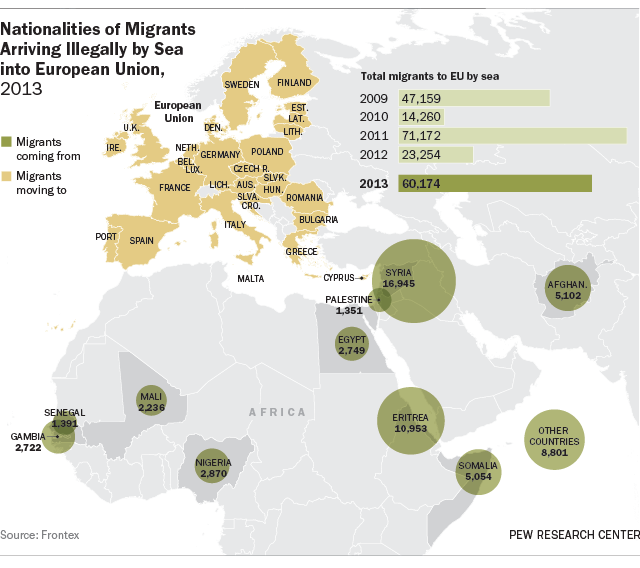 Many are fleeing potentially dangerous situations at home, and as conflicts around the world have changed, so have the national origins of migrants by sea, for instance. Today, roughly a quarter originate from Syria, often crossing through several countries before taking the final voyage from ports in Egypt or Libya. But there were very few boat migrants from Syria five years ago. 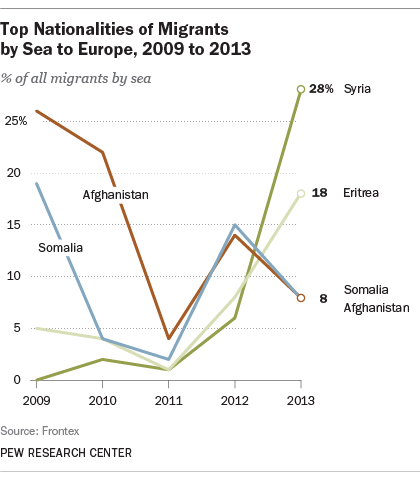 At that time, nearly a quarter of boat migrants entering Europe were from Afghanistan. Today, fewer than 10% are from Afghanistan. 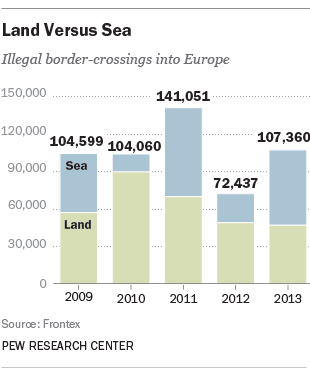 Europe isn’t the only destination for migrants arriving illegally by sea, but it is a popular one. Some migrants have set sail for the United States from Cuba and Haiti, but only about 3,000 were known to have arrived illegally by boat in the U.S. in 2013. In recent years, Australia has received an increasing number of sea migrants – many from Sri Lanka, Iran and Afghanistan – though the number attempting to access Australia also is smaller than the number entering Europe, numbering about 18,000 in 2013. Migrants also attempt to illegally enter the Arabian Peninsula by sea. Occasionally, migrants will enter Canada illegally by sea, but due to its northern geography this is a relatively rare event. A large number of migrants by sea come to Europe from countries in sub-Saharan Africa; Eritrea has surpassed Somalia as the leading country of origin in that region.